Members of Congress pose with three Monuments Men at the medal ceremony. Speaker of the House John Boehner is known for being a passionate, often emotional speaker. Addressing hundreds of attendees during the presentation ceremony on Oct. 22 at the U.S. Capitol’s Emancipation Hall, Boehner blended emotion and history in his praise of the 350 heroes who helped preserve millions of artistic and cultural items during WWII. Watch Speaker Boehner’s remarks. Acknowledging that this will be his last medal ceremony, Boehner said he was privileged to preside over such events, especially considering the long history of the Congressional Gold Medal dating back to the American Revolution. 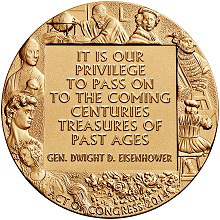 The medal’s history, remarked Boehner, as he addressed four surviving members of the Monuments Men in attendance, shows a chain of preservation that the honorees can appreciate. The medal’s significance, he continued, is something that all can appreciate. “Knowing who we’re from shows our children what they can be. No task is more precious than that. No award is greater than this,” Boehner said. Members from Congress joined Boehner with bipartisan praise for the Monuments Men, including representatives Michael E. Capuano, Kay Granger and Nancy Pelosi and senators Roy Blunt, Robert Menendez, Harry Reid and Mitch McConnell. 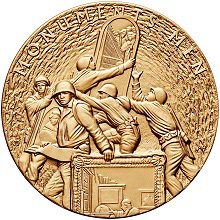 Public Law 113-116, which required the United States Mint to strike the Monuments Men Congressional Gold Medal, also authorizes the bureau to strike and sell bronze reproductions of the medal. Read the U.S. Mint’s press release regarding the medal. Replicas can be purchased via the U.S. Mint’s website or by calling 1-800-USA-MINT (872-6468). Hearing- and speech-impaired customers with TTY equipment may call 1-888-321-MINT (6468).